Home | Education | MathCON for 5th-12th grade students has gone national! MathCON for 5th-12th grade students has gone national! 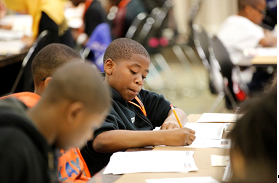 MathCON for 5th-12th grade students has gone national! 700 finalists out of 45,000 from 42 states will compete in Chicago at the University of Illinois at Chicago. Where can you find 45,000 excited kids, and 700 of them travel to a cool city for prizes? They are from 42 states and 330 schools and it’s not Disneyland, Busch Gardens or Sea World? It’s MathCON (www.mathcon.org), a national math competition phenomenon for 5th through 12th graders. This rara avis was born 7 years ago in 2008, and started with just 128 students in grades 5-8, competing with each other in Indianapolis. That year, the very first MathCON was hosted by the Indiana Math & Science Academy, a STEM-focused K-12 public charter school. Students came from 15 schools across the Concept Schools network. In 2012, the competition expanded and was then held at Loyola University in Chicago, Illinois. MathCON had then grown to accommodate not only the middle and but also high school grades. How it works is, students from all types of schools, including home-schooled children, in the middle and upper grades compete across several mathematical disciplines: algebra, geometry, measurement, data analysis, number systems and pre-calculus. They take an online assessment to qualify. 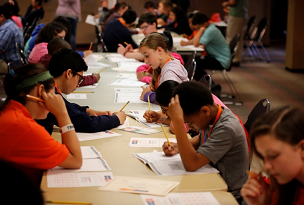 This year, out of the 45,000 who entered, over 700 students qualified to advance to the finals at the University of Illinois at Chicago to go head to head—brain to brain. Each 1st place student in each grade receives an Apple iPad. Second place students will receive $200.00 and 3rd place winners will win $150.00. MathCON even has an Honorable Mention awarded to students who place the 4th through 10th. In the competition’s first four years, MathCON was significantly teacher-directed, whereas teachers selected students who in their opinion had the mathematical prowess and acumen to sustain a rigorous competition. When an online qualifier was put in place in 2013, it opened up the competition more and the scores propelled kids forward! Even the most uninterested students were now breaking through to the finalists’ circle. This has become a popular way for students to show off and demonstrate what they have learned. This year, the top 100 student finalists from each grade level will descend upon Chicago to participate in MathCON 2015 whose theme is: “Stronger Math, Brighter Future”! This will be the first year that MathCON has gone nationwide. If we do the numbers, so to speak, that means 100 students from each grade 5-12, one to two parents per student, maybe other siblings and friends will tag along. Engaging in some elementary addition, that adds up to over 800 people! What a great thing for the city of Chicago and STEM education! MathCON covers all these domains, plus process standards because it is not just about content, it is about how students access that content on a pathway to understanding and ultimately application or theoretical transference in appropriate situations. On the other hand, the Common Core Standards for middle through high school build on the best standards we have in place already while also offering a profound shift to depth not breadth—so focusing deeply on the major work in each grade. (Common Core Standards: Standards for Mathematical Practice (2015) available at http://www.corestandards.org/Math and http://www.corestandards.org/other-resources/key-shifts-in-mathematics). MathCON like the Common Core Standards for Math, strives to make students have a razor-sharp understanding of concepts but also have an indomitable sense of process and mathematical fluency. The capacity to be able to solve problems in the classroom but also have the ability to confront the math out in the world is key. Essentially, it is not what are students do math-wise, but how they do it as well. At MathCON they get the best of both worlds—an intense, academically competitive experience and a chance to connect with other like-minded students. While the adults are cheering them on, inside the Forum will be an “it’s-OK-to-be-smart-and-want-to-learn” atmosphere. Many of the children we serve with our 30-school network across the Midwest rarely, if ever, have that experience. Ayhan Caputlu, Director of Math Education at Concept Schools and initiator of MathCON, always wanted to challenge kids. He had been teaching for 15 years and looked to extend math beyond the classroom walls. He envisioned an activity that was student-centered and had a healthy competitive spirit. He wanted kids not to be satisfied with achieving a C or a B letter grade and just being happy they passed his course, but to really push them out of their comfort zone. Already a math textbook author, he developed a pathway where students could stretch themselves and have the opportunity to travel to a world-class city to do it! Brand new this year is the MathCON Photo Contest (view photo entries at http://mathcon.org/mathcon-2015-photo-contest). It is open is open to all students―whether they are participating in the arithmetic portion of the exam or not. This is the first year MathCON will explicitly speak to Math being all around us, not just bound is the pages of a textbook. It is something we can see, touch and feel. There are 150 artworks submitted from all over the United States. Thirty finalists will have their work sent to over 2000 teachers who will respond in a poll to select the top three. First prize is $300.00. Second prize is 200.00 and third prize is $100.00. These prizes will be awarded to the winning students the afternoon of MathCON at the Awards Ceremony. Concept Schools is a nonprofit charter management organization that focuses on college prep and operates 30 STEM-focused public charter schools throughout seven Midwest states. Concept Schools serves urban and economically disadvantaged neighborhoods and is known for its commitment to advancing high-quality education options and leading national and international conversations on educational best practices.